The heady days of the real estate bubble are a distant memory. Gone is our pre-recession zeal to adorn our McMansions with granite countertops, Berber carpets, and other impressive improvements. At first blush, this more financially conservative approach to home ownership doesn't bode well for home-improvement retailers, who benefited big-time from our short-lived obsession with bigger and better homes. Many American homeowners are getting back to basics, finding contentment in their current homes, and planning to stick around for a long while. That said, committed homeowners -- as opposed to short-term real estate speculators -- will always hammer out necessary renovations as necessity demands and time and money permit. What will that mean for companies like Home Depot (HD) and Lowe's (LOW)? Home Depot reported heartening second-quarter earnings last week. Net income increased 14.3%, to $1.4 billion, or $0.86 per share. Total quarterly sales increased 4.2%, to $20.2 billion, and same-store sales jumped 4.3%, with a 3.5% increase in the much-watched U.S. market. Lowe's presented far less encouraging tidings. Second-quarter net income was basically flat at $830 million, although earnings per share increased 10.3%, to $0.64 per share. Total sales increased an anemic 1.3% in the quarter, and same-store sales fell 0.3%. Under these circumstances, Home Depot looks like a better value than Lowe's, simply because its outlook is more positive right now. Home Depot's forward price-to-earnings ratio is 12, and Lowe's sports a forward P/E of 11. These forward multiples are about on par with other big-box retailers like Wal-Mart (WMT) and Target (TGT). Incidentally, don't be swayed by Lowe's just-announced $5 billion share repurchase plan. This company's clearly at a competitive disadvantage. Prospective long-term investors should focus on that, instead of being distracted by Lowe's attempts to "sweeten the deal" through stock buybacks and other short-term tactics. The retail climate will be tough in the second half of this year, and the U.S. housing market still stinks. In fact, delinquent mortgage payments ticked higher in the second quarter, making home improvement retailers' prospects look even grimmer. 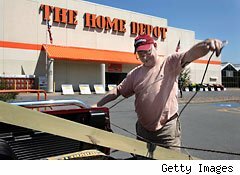 Although Home Depot looks like a smarter buy than Lowe's, keep economic headwinds in mind before giving its shares a home in your portfolio. Home Depot's relatively strong quarterly results imply that it's stealing market share from Lowe's, but that doesn't indicate that there's much overall growth coming in the foreseeable future. These two rival retailers are fighting over scraps in a growth-constrained space. Hunker down with Home Depot if you must, but leave expectations for truly heady near-term growth at the door. Motley Fool analyst Alyce Lomax does not own shares of any of the companies mentioned. The Motley Fool owns shares of Wal-Mart Stores.